This book presents and discusses alternatives to ordinary transmission lines for the design and implementation of advanced RF/microwave components in planar technology. This book is devoted to the analysis, study and applications of artificial transmission lines mostly implemented by means of a host line conveniently modified (e.g., with modulation of transverse dimensions, with etched patterns in the metallic layers, etc.) or with reactive loading, in order to achieve novel device functionalities, superior performance, and/or reduced size. The author begins with an introductory chapter dedicated to the fundamentals of planar transmission lines. Chapter 2 is focused on artificial transmission lines based on periodic structures (including non-uniform transmission lines and reactively-loaded lines), and provides a comprehensive analysis of the coupled mode theory. Chapters 3 and 4 are dedicated to artificial transmission lines inspired by metamaterials, or based on metamaterial concepts. These chapters include the main practical implementations of such lines and their circuit models, and a wide overview of their RF/microwave applications (including passive and active circuits and antennas). Chapter 5 focuses on reconfigurable devices based on tunable artificial lines, and on non-linear transmission lines. The chapter also introduces several materials and components to achieve tuning, including diode varactors, RF-MEMS, ferroelectrics, and liquid crystals. Finally, Chapter 6 covers other advanced transmission lines and wave guiding structures, such as electroinductive-/magnetoinductive-wave lines, common-mode suppressed balanced lines, lattice-network artificial lines, and substrate integrated waveguides. 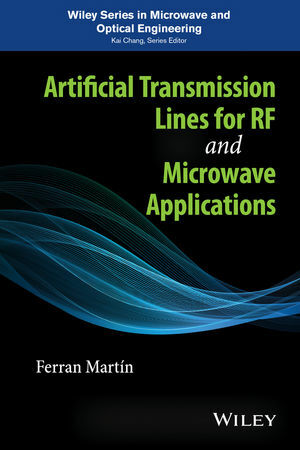 Artificial Transmission Lines for RF and Microwave Applications provides an in-depth analysis and discussion of artificial transmission lines, including design guidelines that can be useful to researchers, engineers and students. Ferran Martín is a Full Professor of Electronics in the Departament d’Enginyeria Electrònica at the Universitat Autònoma de Barcelona (UAB) in Spain. He is the head of the Microwave Engineering, Metamaterials and Antennas Group (GEMMA) at UAB and the director of CIMITEC, a research Center on Metamaterials. Dr. Martín has generated over 450 book chapters, journal papers and conference contributions (most of them on topics related to the book), and has supervised 14 PhDs. He holds one of the Parc de Recerca UAB/Santander Technology Transfer Chairs at UAB, and has been the recipient of the Duran Farell Prize (2006) and the ICREA Academia Award (2008 and 2013). He is IEEE Fellow since 2012.